← Very Inspiring Blogger Award, Thanks Palm Rae Urban Potager! Egret flips a fish prior to swallowing it. Thanks to Cheri Lucas Rowlands and WordPress for the Weekly Photo Challenge: Grand prompt. She asked for jaw dropping, grand. The fisherman literally did a jaw-dropped double-take when joined by the egret, as did I. It was a grand experience in watching inter-species “trust” unfold. Thanks to Sue Llewellyn for her Word A Week Photography Challenge: Shadow challenge. The egret shadowed the fisherman for more than 2 hours that afternoon. It is not recommended to feed any wild animals, but this bird was obviously already versed in fishermen as food sources before that day. Posted on December 11, 2013, in A Word A Week Photo Challenge, Art, Birds, Egret, Fishing, Kayaking, Nature Photography, postaday, Weekly Photo Challenge, Wild Bird Wednesday, Wildlife Photography, Wordless Wednesday and tagged egret, postaday. Bookmark the permalink. 23 Comments. I’m so glad you like these egret photos! Many thanks for visiting and for your kind words. In the Netherlands, grey herons often stand close to anglers. While about 100 years ago, they were shy, as they were hunted. It’s good that the herons there are no longer hunted, and their population increasing. It’s dangerous for them to cavort with fishermen, due to the risk of entanglement by the fishing line or getting caught with the a hook. I was concerned about this egret that day, and stayed with them as they fished together as long as I could in case the egret got hurt. When I had to leave after more than two and a half hours, they were still together. I went back to that spot the following morning, nd the egret was there again on the rovks, no doubt waiting for the fisherman. It was touching to see, although I never saw that fisherman there again. Yes, that is a risk for herons indeed. I have not read about any heron species in the Netherlands, apart from grey herons, standing close to fishermen. I was about to say that maybe its related to the bird’s size – that the great blue and grey herons are sufficiently tall to feel empowered to approach large beings like humans – but then I remembered seeing photos of small egrets mooching from fishermen. This is wonderful-so who caught the most fish that day? I am betting the heron! You bet right! Of course, the fisherman was sharing his, unlike the bird. Wow, fascinating as always! Great photos! Glad you like this one, thanks for your kind compliment! This is some amazing stuff. Thanks so much for sharing this fantastic interaction. Though I’m also a bit uneasy about the bird getting too habituated to humans. You’re welcome, and thanks for your kind comment. I agree strongly with the concern about wild animals becoming too accustomed to humans. This bird was definitely already VERY used to being near fishermen. I watched the bird approach the fisherman from a couple hundred yards away. I was setting up for a long shot, expecting the egret to flee when it noticed the human, but was sounded when the bird flew right up to the man. On the one hand it was magical and a photographer’s dream encounter and on the other hand, disturbing and worrisome. Fortunately no harm came to the egret that day. Such touching companionship between man and bird. Great shots. I’m so glad you like this post. Many thanks for your kind words! 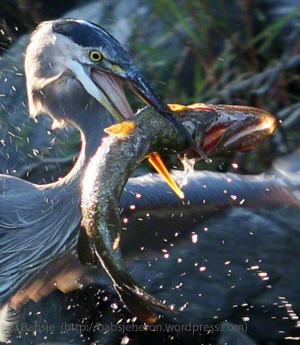 I’ve seen egrets when they catch a fish and maneuver it into their mouth … fascinating. These photo are perfect. Great capture …!!!! Thanks! Isn’t it amazing how they maneuver the fish before swallowing? Their tongues are amazingly adapted to manipulate their food so nimbly so quickly. We have many of these egrets here in Staten Island where I live. I love them. You’re fortunate to have many egrets there, Gayle! We’ve only had that one at this lake, but it was such a spectacular bird. Hoping it returns next summer. Glad you like it, thanks for your kind words! Both the fisherman and I did double-takes when the egret approached him instead of taking off. One photo I didn’t post shows the fisherman using his iPhone’s camera to capture the egret, a very special moment. I never saw the fisherman back there again, it was just that one wonderful afternoon.